A dark cloud no longer hangs over my horse manure, that is, the horse manure that I occasionally truck over here to add to my compost piles. I wrote a few weeks ago about the possibility of herbicide that, when applied to hay, retains its toxic effect when an animal eats the hay and even, for a long time, after that animal’s manure has been composted or spread on the ground. My herbicide residue concerns were soothed with a simple assay that showed satisfactory growth from bean seeds in both hay that was suspect and hay of known integrity. Also, the bedding in the horse manure is mostly wood shavings rather than hay. But another ugly dragon kept raising its head above the manure. Another chemical, this time, Ivermectin, a de-worming medication given to horses (and other animals). Ivermectin or its metabolites might pass through the animal and injure soil dwelling creatures such as beneficial nematodes and earthworms. Past studies have shown negative effects on, for example, “dung fauna and degradation of faeces” (to quote a research paper from 2006). Ivermectin is, admittedly, a very useful material, even useful in humans to combat lice, bedbugs, and some more frightening tropical afflictions such as river blindness and elephantiasis. Agriculture is always a balancing act, but I like to keep my soil-dwelling partners happy. So I was gladdened when a veterinarian recently directed me to a Stanford University publication that summarized research findings on the environmental effects of Ivermectin. To whit: Ivermectin is excreted and it can affect earthworms, springtails, and other fauna. But it degrades quickly at summer temperatures (1-2 weeks, but much longer in winter) and within a day or two of exposure to bright sunlight. With temperatures within my compost bins reaching 150°F., or more, with the compost sitting many months before use, and with the compost being spread on top of the ground, little Ivermectin would end up in the soil. And soil anyway naturally has low levels of this compound. Let’s look aboveground, at stems; there’s pruning to be started. With well over a foot of snow on the ground, I turn my attention to taller plants. The snow is actually an advantage because, with snowshoes on, I can reach more than a foot higher into the branches without a ladder. For now, I’m going to start with the easiest pruning, mostly with plants that don’t need regular pruning beyond removing dead, diseased, broken, and grossly misplaced branches. Right here, such plants include pawpaws, plums, cornelian cherries, and a teenage honeylocust tree. Light is important for fruit production from the fruit trees and, generally, to keep diseases and insects at bay, so I also prune away enough branches to let remaining branches bathe in sunlight. I go at the pawpaws with one more goal in mind, to keep fruit from forming either too high in the tree or two far out on the limbs. Pawpaw trees will grow 15 to 25 feet high but I harvest fallen fruit from the ground. By my estimation, fruit can make a soft landing, undamaged, from a height of about 10 feet onto mulched ground. So I lop back the tops to weak side branches at about that height. Each pawpaw flower is a multiple ovary, potentially spawning up to nine fruits, each of which can weigh more than half a pound. That’s a lot of weight perched onto the end of a branch, so I shorten long branches to decrease leverage of that fruit load. I actually did begin pruning a few weeks ago, before the first snow fall. 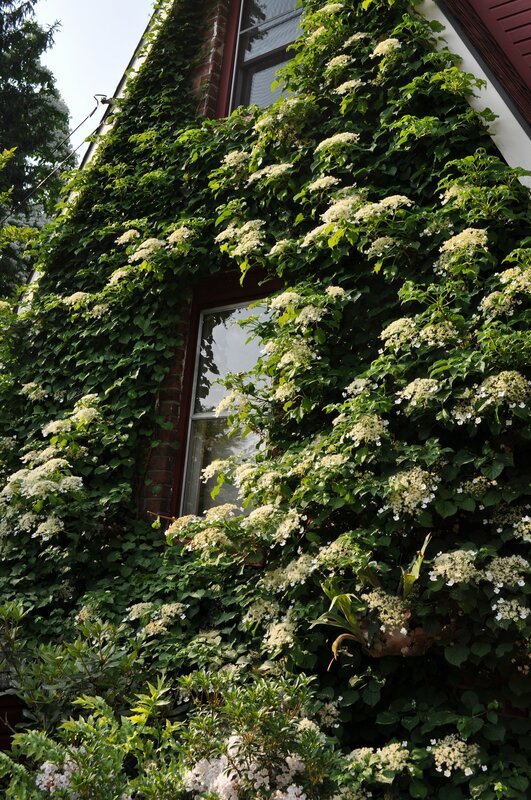 The plant was hydrangea — no, not the common bigleaf hydrangea which has many people scratching their heads about how to prune, but climbing hydrangea (Hydrangea anomala subsp. petiolaris). Climbing hydrangea is one of the most beautiful vines, even right now as the peeling, pale cinnamon, bark is in focus among the leafless stems. All summer long, the stems are clothed in lustrous green foliage and, in early, summer clusters of white flowers twinkle against that backdrop like stars in the dark sky. As expected, the vine took a few years to get firmly established. Now it threatens to engulf my brick home except that I want to restrict it to only the north wall. Every year now, I prune back stems creeping like groping fingers around the east and west walls. And each year the flower stems reach further directly out from the wall, so I also shortened them. The present pruning doesn’t permanently subdue the plant. This summer, I’ll again shorten the wandering stems, and I’ll be back at it again next winter and for winters to come. This entry was posted in Design, Fruit, Gardening, Pruning, Soil and tagged climbing hydrangea, herbicide, ivermectin, pawpaw, pruning. Bookmark the permalink. Trackbacks are closed, but you can post a comment. 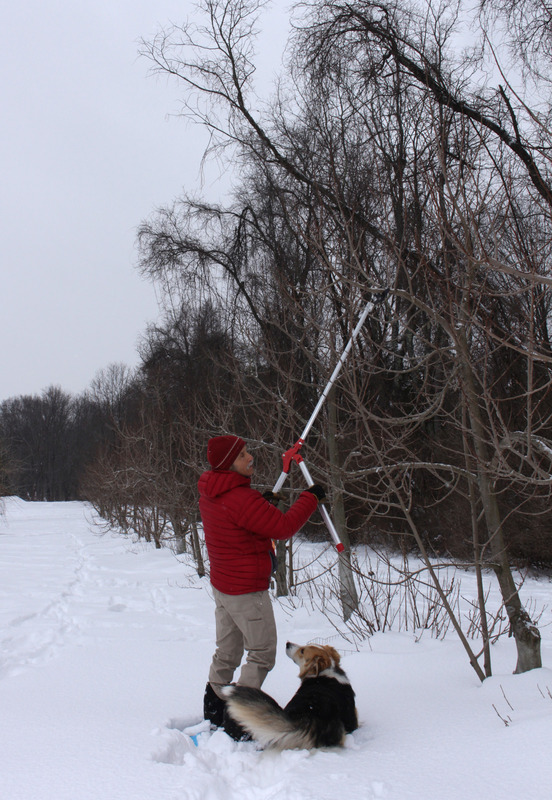 Lee, thanks for the reminder to get out and prune some things, and to use the snow as an advantage! I always wait till it melts enough so I can get a ladder out there, but who knows when that will be this year? I know you don’t grow many apple trees anymore, but when do you recommend starting to prune them, and same question for pears, both Asian and European? Start pruning as soon as you can. The general recommendation is to begin after the coldest part of winter — early February — is over. Actually, I do still grow apple trees, or at least try to grow them on my poor site — bad air but good soil. I’m not complaining, though, I harvest plenty of blueberries, grapes, pawpaws, kiwis, and so many other fruits each year. Thanks for the information on both the herbicide and the dewormer. I can rest easier about those. Now what about antibiotics routinely given to cattle or other manure producers? A quick, but not thorough, perusal of the research indicates that composting significantly reduces or eliminates antibiotics via decomposition. i read an article you wrote for Mother Earth News about growing peach rootstock from pits….I froze a bagful in the fall from local peaches….was freezing them the wrong thing to do? Suspect it mimics the stratifcation that they would endure in the garden all winter albeit with no snow cover to moderate temps…should i proceed with cracking the hulls, removing and putting them in moist soiless mix in the fridge? The pits need to be “stratified.” Stratification occurs when the pits are kept moist (but not submerged in water) and at temperatures between about 30 and 45 degrees F. The easiest way to do this is to put the pits into a plastic bag of moist potting soil in the refrigerator. You might try that with your pits. Cracking the shells would help. I think you can still prune it now. But do it today, or, at least, very soon, so it has time to prepare for winter. Many thanks! We pruned it back a bit a few days ago, and put screw eyes into the wall and put up some rope to hold the top part that we didn’t completely prune off close to the wall. We hope future growth will adhere. 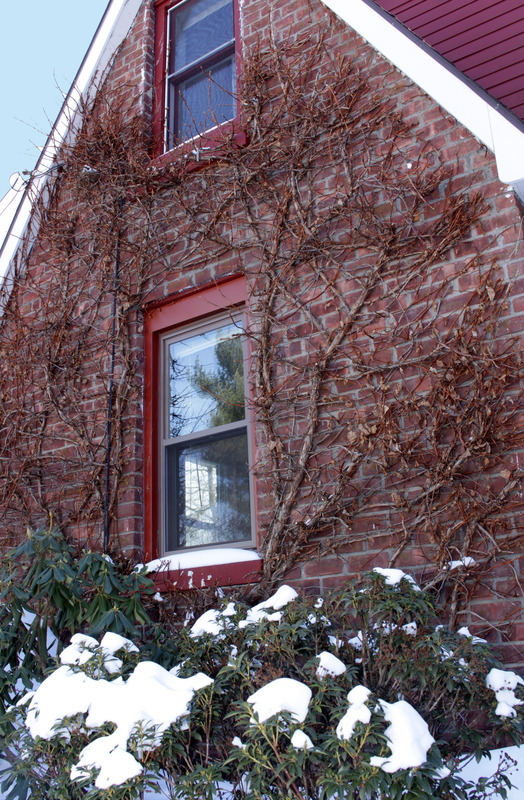 To keep the plant from overtaking my house, I prune it back twice during the growing season. It’s on the north wall of my house, and that’s the only plance I want it to be. I also want it off the windows and eaves. I did the bean test with some composted horse stall material from a commercial composter and I was struck by the difference (in my non-scientifically validated results). The beans in the commercial compost (50% mixture) were stunted with odd shaped leaves compared to the beans grown in the home brew. I may find someplace other than my veggie patch to use this horse stall compost. Creating my own compost takes much time and effort but I now feel validated and will shy away from taking the easy way out (at least until I know how to ask educated questions of commercial producers). When I make my own ( I do occasionally add rotted manures) I know what is going in the mix. A belated thanks for looking into this. Do you still use manures? Yes, I usually use some manure in my compost. It’s horse manure bedded mostly in wood shavings.